I've actually been playing for the last couple of weeks. I took a good 5-6 weeks off to try and do my essay and do my exams, but my heart just was never in it. 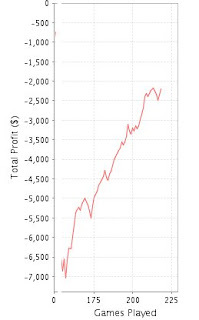 Despite all the ups and downs I've had over the last 3 years, playing poker is what I want to do right now. I've finally got myself to dip limits and play a steady amount of heads-ups in the lower range. I've been very consistent thus far, and though I'm not sure 250 heads-ups is a big enough sample, I've been achieving approximately a 60% win rate. 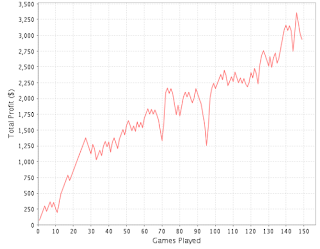 I have also been playing a lot of MTTs and a bit of low level limit poker. I never realised how bankroll sucking MTTs can be. I'm about €1000 down in them over two weeks, and have only cashed in two events. Came something like 5/60 in a €50 Freezeout for €300 and a slightly more encouraging 3rd out of 402 runners in a €10 Freezeout for €500. I'm enjoying playing them, so I think I'll keep playing them alongside Heads Ups, but will keep an eye on profitability cos they haven't proved to be that yet. Obviously though variance is to be expected. I've just about covered my MTT losses with my limit ring game wins, though I don't think I will be playing much of these. Managed to get caught up in the Poker Trillion controversy as I had started playing there for the first week due to the special deal they do on live tourney discounts. Will see what network they move to to see if I'll still play there. Started playing on poker.co.uk after this happened and have run steady on both sites. 0 Comment to "A steady two weeks..."
I won a poker tournament!